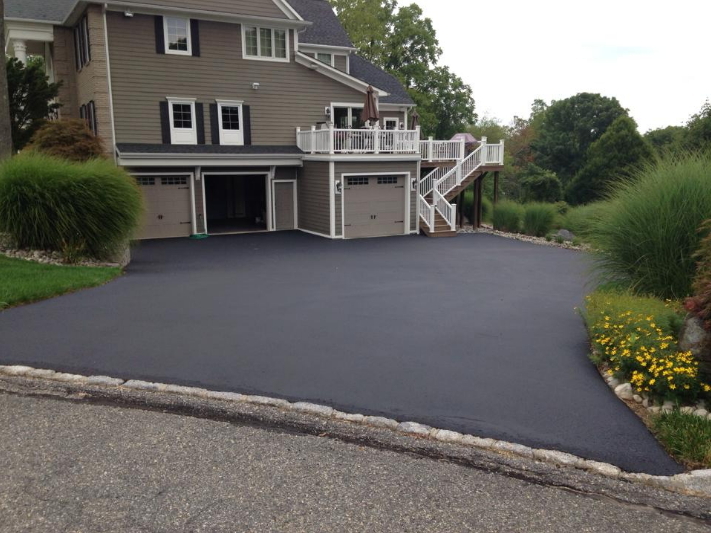 When Should You Sealcoat or Repave Your Driveway in New Jersey? When Should You Sealcoat or Repave Your Driveway? If you’re a proud homeowner—the sort of person who takes pride in maintaining a clean, properly repaired and well-kempt property—you’re likely aware of the importance of driveway maintenance. A home’s driveway, after all, is one of the first things a visitor notices about your property. If it’s cracked and rutted, it suggests that its owner isn’t necessarily concerned with the important details of home ownership. And yet even if you are prepared to fix your faulty driveway, you’ll still need to decide whether its cracks and ruts are minor enough to allow for a driveway sealcoating job in New Jersey, or if you’ll need to have the entire driveway repaved. That can be a tough question for the average homeowner to answer, which is why we’ve put together an article that will help you decide exactly which sort of repairs you should be considering. How severe are your driveway’s cracks and breaks? There’s a fine line between a driveway with cracks that are too severe to simply sealcoat over, and one that can be adequately repaired with a driveway sealcoating job. The easiest and most accurate way to determine on which side of that line your pavement sits is to look for what professionals refer to as “alligator cracks.” These are severe breaks in your driveway’s pavement that somewhat resemble the hide of an alligator—thus the name. When these so-called alligator cracks begin appearing in your driveway, you’ve entered a realm where driveway sealcoating will essentially act as a temporary Band-Aid. These are the sorts of cracks that can’t be properly filled. Unfortunately, your only reasonable option at this point is to have your driveway’s entire asphalt redone. How can you avoid the cost of a complete repaving job? No surprise here: It really all comes down to the severity of the driveway’s various issues. If the cracks in your driveway are relatively minor, for instance, and aren’t covering a majority of the pavement, there’s certainly a decent chance that a driveway sealcoating job will do the trick. What else? If you’re only dealing with relatively minor issues of aesthetics, such as basic discoloration of your driveway’s pavement, or the pavement’s dark black coloration fading too quickly from the heat of the sun, these are situations that don’t call for an entire repaving. Sealcoating should give you the results you want in situations such as these. How often should a driveway be sealcoated? When you consider that residential driveways are, relatively speaking, low traffic areas, it makes sense that a properly completed sealcoating job should last for roughly two to three years. Some over-anxious homeowners, however, make the surprisingly common mistake of recoating their driveway every year, which can cause more trouble in the long run. The overuse of sealer can lead to cracking, flaking and peeling if it builds up, which is exactly what happens when the sealer is applied with too much frequency. If you’ve been approached by someone offering to coat your driveway who suggests otherwise, you’re probably dealing with an unscrupulous and dishonest person, so be aware. How can you tell if you’re working with an honest company? At Beckage Sealcoating, we exclusively use materials that meet every last required federal and state specification. Indeed, the reputation of our company has been specifically built on the satisfaction of our customers, which is also why we take great pride in letting you know that we stand behind our materials and workmanship 100 percent. We encourage you to get in touch with us today, regardless of whether you’d like to go ahead and request a quote, or if you simply have questions you’d like to ask us about the state of your driveway and the sort of work it may require. We look forward to meeting you, working with you, and delivering the sort of driveway that will keep a house-proud homeowner coming back to us for years to come. Previous PostThe Benefits of Asphalt Over ConcreteNext PostHow Does the Sealcoating Process Work?